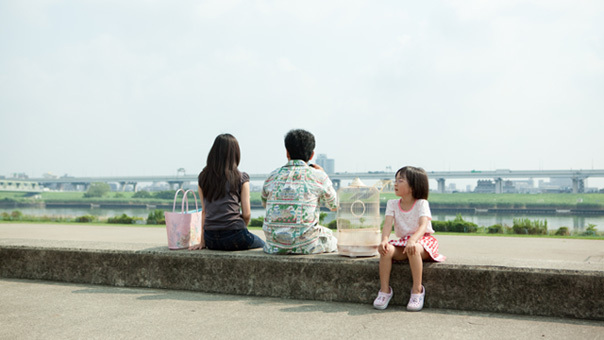 Mikio Kobayashi lives with his family in a quiet neighbourhood of suburban Tokyo. He runs a modest printing shop downstairs, doing much of the work himself. His young wife Natsuki manages the house and takes care of Eriko, Mikio’s daughter from a previous marriage. Mikio’s recently divorced sister, Seiko has also moved in and takes part in the local neighborhood council. It is a rather uncomplicated state of affairs till a gentleman named Kagawa comes calling, under the guise of having information about the family’s missing parrot. He claims to be the son of a former benefactor of the printing shop, and coaxes Mikio into offering him work and lodging. Here begins an unraveling. Very soon, Kagawa foists his wife Annabelle (who claims at different points to be Brazilian and Bosnian) on to an already cramped household. Much to Natsuki’s discomposure, Annabelle begins to covet the attentions of both Eriko and Mikio. Meanwhile, Kagawa manages to keep a shrewd tab on the secrets and misdemeanors of the family, subsequently wielding this knowledge to control the house and business. When the neighbourhood watch makes a push to clear illegal aliens and squatters from their vicinage, the Kobayashi house becomes an unwitting site of refuge. Hospitalité opens with a panoramic view of the parkland near Mikio’s house: the elevated highway and train tracks in the distance, an expanse of overgrown shrubbery, and a rundown shack in the middle of it all. One might be tempted to ruminate on the unmistakable allegory in this opening image alone, but that would be reductive and a great disservice to Koji Fukada’s fine and nuanced film. There is nothing quite so obvious about Hospitalité. Ostensibly a portrait of a modern Japanese household, it soon emerges as a dark and witty commentary on xenophobia, fidelity (domestic and sexual), globalisation and the lofty aspirations of the middle class. These are hardly subjects particular to this milieu but Fukada’s masterstroke is in embedding everything within the polite formalities so typical of Japanese society. Even as characters manipulate and deceive each other, there is a veneer of propriety. The chief architect in this mannered madness is, of course, Kagawa. Kanji Furutachi plays him with a menace that is curiously effacing. It is a remarkably mysterious performance – almost Sellers-esque – as one is never able to second-guess him, or, in fact, diagnose the root of his duplicity. He is offset quite superbly by Kenji Yamauchi, whose Mikio is a clumsy soul, bemused by the world around him. One of the more poignant images in this largely humorous film is of him mixing ink in the shop, stewing in his guilt and avoiding eye-contact with his wife as she passes him by. Little does he know that Natsuki is stepping out to whitewash her own little deception. The rest of the cast are compelling and consistent in their portrayal of the pathological idiosyncrasies of the post-industrialist bourgeoisie. There is a disarming simplicity of style to Hospitalité that conceals some very delicate and precise filmmaking. I am always intrigued when characters are framed from behind, and Fukada does this often and well. There is suddenly the hint that you are interloping, not unlike Kagawa, as the family engages in more mundane activity, such as brushing their teeth. The art direction is also carefully understated. There is an aesthetic untidiness to the shop, and the two printing machines are as much of an odd couple as Mikio and Kagawa (or Mikio and Natsuki). Eventually, it is the delightful absurdity of the people and situations in Hospitalité that make it memorable. Irrespective of its larger sociological or philosophical import, it is Fukada’s unassuming wit that is most penetrating. The frenetic invasion of the Kobayashi house at the end is strikingly reminiscent of the teeming cabin in A Night at the Opera. And in a delightfully black moment just after that, Natsuki and Mikio smile coyly at each other while dancing at an impromptu party. She confesses to him that she slept with a young man. In a beat, he slaps her and she returns the favour. The gathering is stunned into silence until Annabelle spontaneously launches into a multilingual ballad. It is a moment that defies all reason but it resounds in the bewildering logic of Fukada’s world, where every moment is quite likely to be an aberration of the last. Hospitalité received the NETPAC Award at the 15th Puchon International Fantastic Film Festival.